Today, I’d like to highlight some young volunteers who have recently made a difference in the lives of people who accept services from Imagine!. The Watershed School kids were great! We split them into two teams: one team worked on cleaning up our vehicles for the first half of the morning, while the other group spent time working 1:1 with CLS participants in Science class, and then they switched halfway through. The kids were very respectful, polite, and eager to help out. 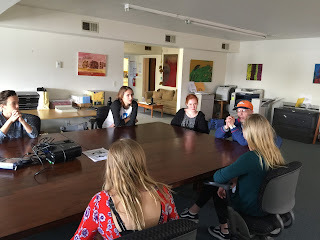 At 11:30, the group came upstairs into our conference room and had a Q&A with John (pictured below, John accepts services from CLS and lives in Imagine!’s Bob and Judy SmartHome). We would be happy to have them back any time! Stacey, Shelly, Bell, Peter, and the volunteers had a blast bowling at Centennial Lanes in Longmont. Lorraine and volunteers planted carrots and lettuce at the Second Start Community Garden in Longmont. Corrina and a volunteer sweeping up hay at the Heart and Soul Ranch during the CLS "Horsin’ Around" class.